Paul is a Lecturer of Biomedical Sciences at Teesside University in the School of Science, Engineering and Design. His past and current research aims to understand disease processes in numerous infectious diseases including E. coli, Salmonella, Microsporidia and Entamoeba. Paul has a real passion for microbes and actively writes papers, reviews, books chapters, and has acted as Associate Editor for several scientific journals. He previously lectured at Newcastle University where he also carried out 15 years of research into pathogens that cause enteric disease. He now lectures on a broad range of biological disciplines covering several modules in the Biomedical Science degree including Medical Microbiology, Life Sciences, Biotherapeutics, Bioethics and Communication, Human Diseases and Immunology, Cell Biology and Biological Methods. Paul is actively involved in promoting links with local schools and colleges through STEMulate and as moderator for Access to HE Diploma certificates delivered through ONE awards. STEMulate is a great way for school students to see what Teesside has to offer and allows students to really get stuck into some experiments! Paul's research centres around pathogens, how they infect us and how our cells respond to them. He uses a variety of model systems including insect and mammalian cells. Recently, Paul's research has focussed on how protein transporters enable pathogens to steal vital metabolites from hosts such as humans. Understanding virulence mechanisms is key to combating infection. We use microscopy and molecular biology to try to decode a pathogen's virulence strategy. These mechanisms have evolved and remained hidden for millions of years so it’s a very interesting job to try to uncover the pathogen's secrets in the lab. We have considerable experience visualising the internal structures of bacteria, mammalian cells and various parasites. Much of this work is published. Some images have won competitions and appeared on several journal and book covers. Microsporidia are fascinating eukaryotic parasites that infect humans and animals. The infection process starts with a spore which injects the small parasite cell into the larger host cell through a long germination tube. These parasites can only live grow inside host cells so they are obligate intracellular parasites. Our work with Microsporidia looks at how they steal metabolites from their host. Below you will see a microscopy image of the parasite from the human pathogenic species Trachipleistophora hominis growing inside a Rabbit kidney cell. 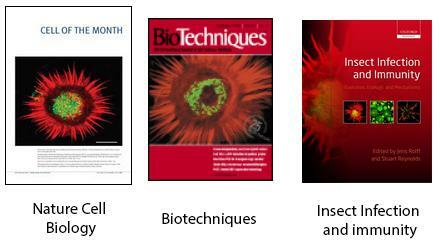 The parasite appears red as they are stained with antibodies against the parasite's nucleotide transporter protein NTT - which allows them to steal nucleotides from the host cytoplasm - and is the subject of the paper shown below. 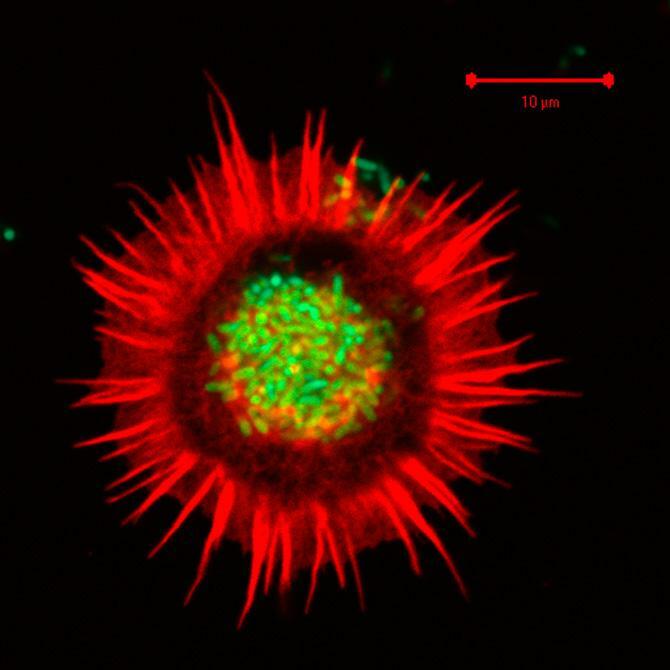 Immunofluorescence of Rabbit kidney cell infected with Microsporidia. Red = parasite membrane transporter. Blue = DNA. Green = parasite organalles called mitosomes. Our paper on nucleotide stealing in Microsporidia, with the cartoon below showing the complexity of the interaction based on our data. 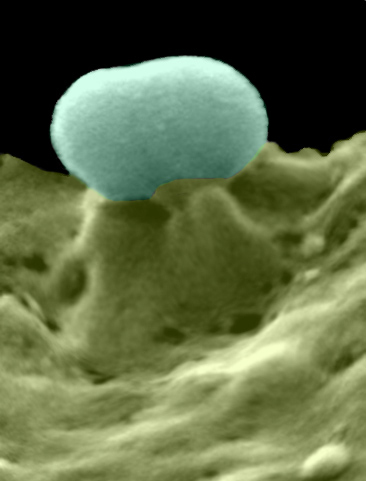 Bacteria such as pathogenic E. coli deliver millions of molcules into the host cell. Here, E. coli are stained blue (DAPI-stained) and can be seen adhering to the outside of the cell. 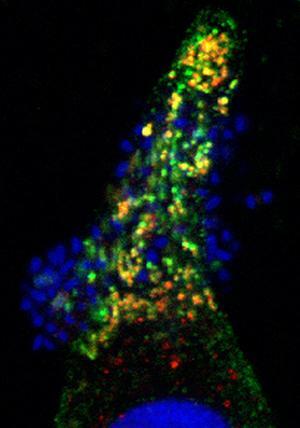 The green and red-labelled antibodies show the E. coli proteins inside the mammalian cell. You can see, there is a hige amount! 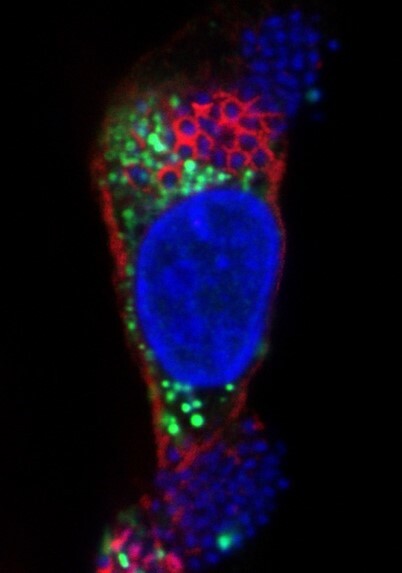 Here you see the E. coli effector protein EspF (green) labelled with an anti-EspF antibody. 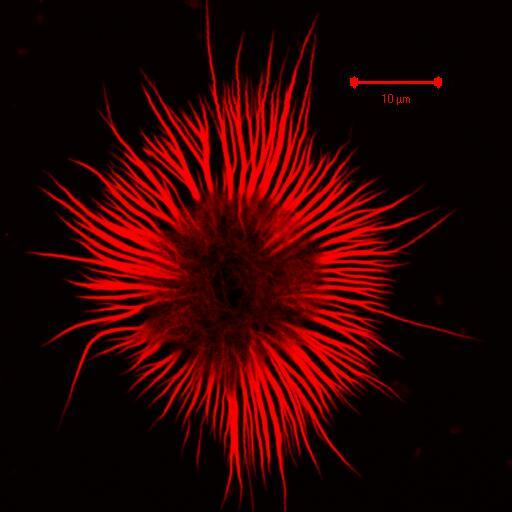 The red is the host cytoskeleton labelled with phalloidin-RFP. Blue is DAPI stained DNA. The amount of bacterial effector protein inside the host cell is phenomenal! The insect immune system is not like our own as it does not use antibodies. Instead, the insect relies on blood cells that can eat enormous amounts of bacteria. It also relies on a cell-cell cooperation event called nodulation where the cells get together to suffocate invaders! 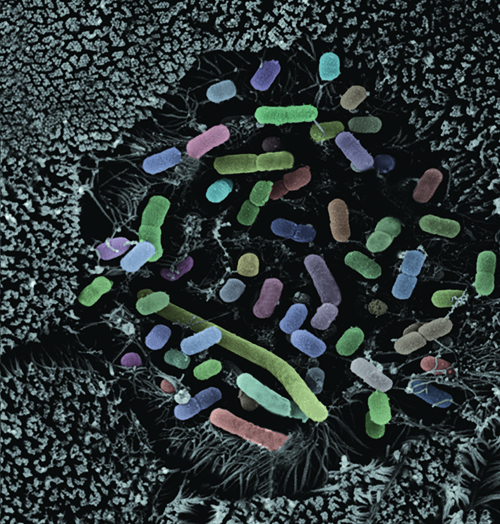 E. coli sinking into our gut microvilli. 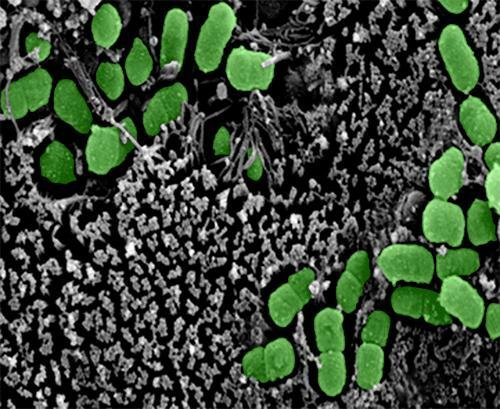 The bacteria has an ingenious way of making the microvilli disappear and we still haven't worked out how it does it. Scanning Electron micrograph. After around 30 min, E. coli causes mass loss of microvilli. Bacteria are pseudo-coloured post-capture so look like Jelly beans! Dean P, Potter U, Richards EH, Edwards JP, Charnley AK, Reynolds SE (2004). 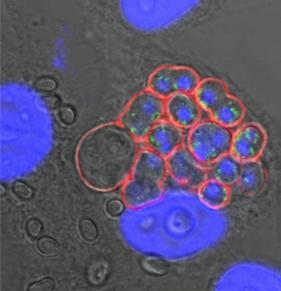 Hyperphagocytic haemocytes in Manduca sexta. J. Insect Physiol. 50(11):1027-36. Au C, Dean P, Reynolds SE, ffrench-Constant RH (2004). Effect of the insect pathogenic bacterium Photorhabdus on insect phagocytes. Cell. Microbiol. 6(1):89-95. Bundey S, Raymond S, Dean P, Roberts SK, Dillon RJ, Charnley AK (2003). Eicosanoid involvement in the regulation of behavioral fever in the desert locust, Schistocerca gregaria. Arch. Insect Biochem. Physiol. 52(4):183-92. Silva CP, Waterfield NR, Daborn PJ, Dean P, Chilver T, Au CP, Sharma S, Potter U, Reynolds SE, ffrench-Constant RH (2002). Bacterial infection of a model insect: Photorhabdus luminescens and Manduca sexta. Cell. Microbiol. 4(6):329-39. Xia Y, Dean P, Judge AJ, Gillespie JP, Clarkson JM, Charnley AK (2000). Acid phosphatases in the haemolymph of the desert locust, Schistocerca gregaria, infected with the entomopathogenic fungus Metarhizium anisopliae. J. Insect Physiol. Sep 1; 46(9):1249-1257. 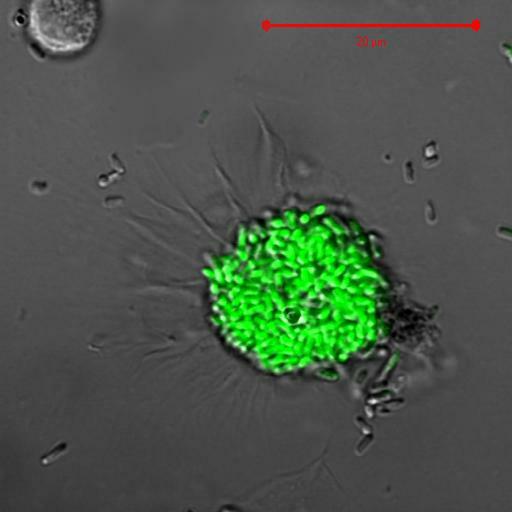 Dean P. Cell of the month: An insect blood cell engulfing bacteria. Nat Cell Biol. (2003) Nov; 5 (11):957. Dean, P., 1 Feb 2019, In : Current Opinion in Chemical Biology. 48, p. 73-80 8 p.
Microsporidia: Why Make Nucleotides if You Can Steal Them? Dean, P., Hirt, R. P. & Embley, T. M., 17 Nov 2016, In : PLoS Pathogens. 12, 11, 13 p., e1005870.